Richman finished third in both the 200m (24.51) and 400m (55.54) dashes at the Vanderbilt Invitational, moving into the OVC lead in the 200m with Austin Peay’s first sub-25 second run since 2014. She now leads the OVC in the 400m standings by more than a second and owns nearly a half-second advantage in the 200m. She shared the track honor this week with Tennessee Tech’s Lisa Wickham. Amato increased her lead in the OVC pole vault standings with a season-best 3.99m mark, placing third overall and second among collegiate competitors. She now ranks 43rd in the NCAA in the event with weeks remaining in her final indoor campaign. 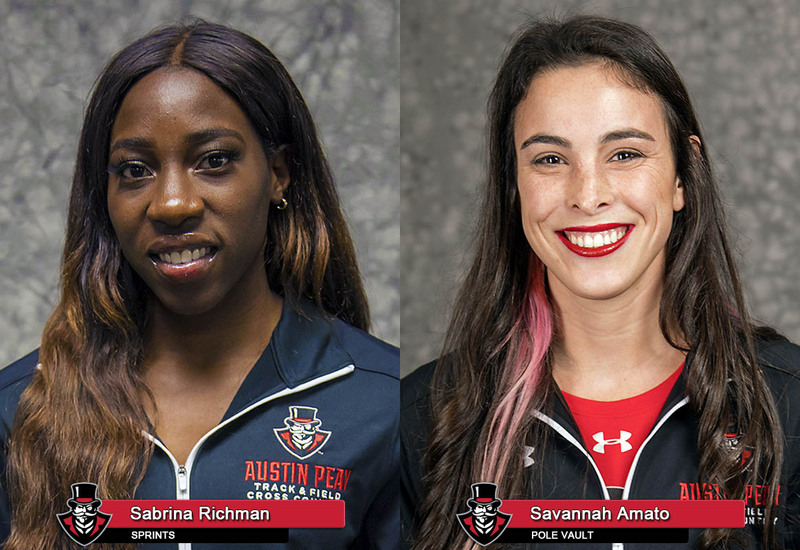 This is the second time this season Amato and Richman have earned OVC honors in the same week; the duo shared the initial honor for the week of Jan. 9, with Amato sharing that week’s honor with Tennessee State’s Genetria Shell. Amato has now won all three weeks the award has been presented, her 11th career weekly honor and the second time in her career she’s won three consecutive Field Athlete of the Week honors; she also won three straight from March 27th-April 10th, 2018. Austin Peay is back in action this weekend at the Thundering Herd Invitational, hosted by Marshall in Huntington, West Virginia.